I’m starting this new category called “My Favorites This Week” where I’ll be posting pictures and mini descriptions/reviews of beauty products, makeup, dishes, books, movies and all possible random things that probably made my day! Today’s edition is on beauty. 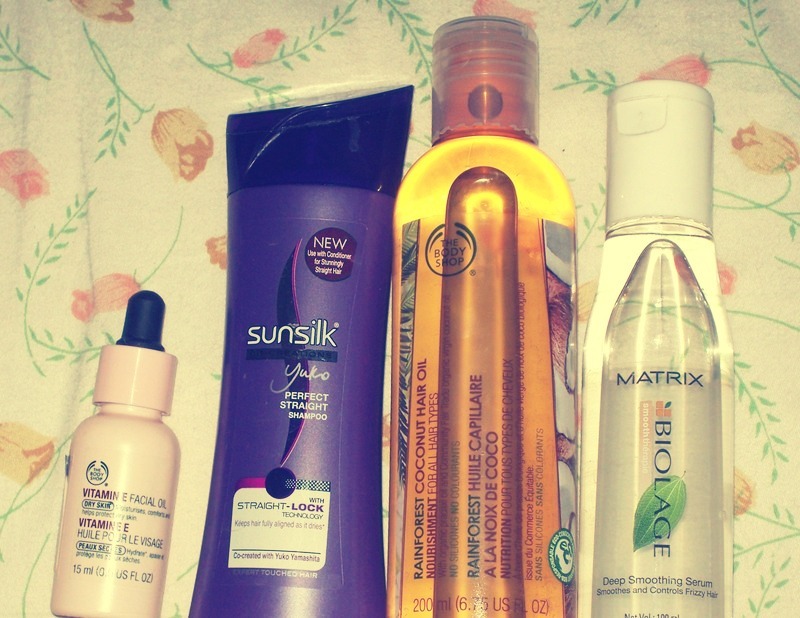 I bought some stuffs from The Body Shop, Sunsilk and Matrix. 1) TBS Vitamin E facial oil : This stuff is good. Not irreplaceable, but definitely good. I use this every once in a while especially when I find the skin around my nose and on my cheeks beginning to peel due to the awkward dryness n the weather (hell it’s summer here!). It’s got a blend of lovely oils like wheatgerm, soy, ricebran (haha yeah some more ingredients and you could make a Chinese stir fry! ), carrot seed, lavender etc. Wheatgerm is known to have the highest concentration of Vitamin E, so yeah that’s good. I’ve heard this works well on hyperpigmentation from other blogs though the bottle itself seems to talk only about dry skin repair. Anyway, that’s cool. Mom loves it too coz it seems to work on her under eye area and crow’s feet. 2) Sunsilk Perfect Straight Shampoo : OK I bought this stuff basically since a moisturizing shampoo and this promised a sleek look. I hoped for it to give my hair some hydration. I’m not a conditioner person(yeah) and this shampoo they say works only when used along with the conditioner. But that apart, I thought it worked pretty well. My hair’s basically wavy-straight and I believe only a flat iron can give me straight hair. 3) TBS Rainforest Coconut Hair Oil : TBS launched this coconut oil as an India only edition.Let me tell you, this is by far the best coconut oil I’ve used. It’s not purely coconut oil as it has pracaxi( some Polynesian nut?) oil and soy oil again. Thankfully no chemicals or mineral oil which is great! Of course pure, plain virgin coconut hair oil is up there but it comes with a bucket load of greasiness, this isn’t half as greasy and very light. Only thing I don’t like is the sickly, sweet smell which TBS markets as coconut and tropical. It’s plain cough syrup, coumarin is to be blamed-this plant extract is used for its sweet smell..too.damn.sweet. 4) Matrix Biolage Deep Smoothing Serum: A simple, basic after wash serum that seems to work only after applying it twice on my fine, shoulder length hair! Well that apart, it gives smoothness and a light gloss. 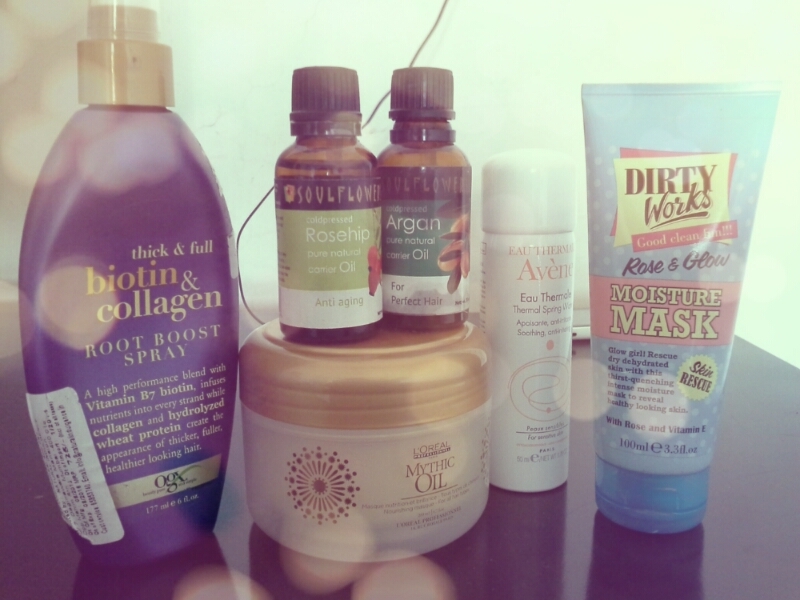 I find that the oil, shampoo and serum complete my hair care needs. So I’m good to go.